September is shaking up to be a huge month for ERC title holder Chris Ingram, starting with a landmark rally in Turkey this weekend. The 24-year-old is making his World Rally Championship debut in Marmaris, with this development perhaps indicative of the amazing progress made during a career still very much in its infancy. This gruelling rally combines smooth open roads with rocky mountainous tracks and starts at the popular holiday resort of Marmaris. Friday’s action includes two identical loops of three tests with a similar format on the Saturday. The business end of the rally sees Sunday’s finale featuring four tests culminating in the Marmaris Power Stage – ending at the entrance to the Asparan service park. Chris has been busy preparing for the event over the last few weeks and has even made some modifications to his car. 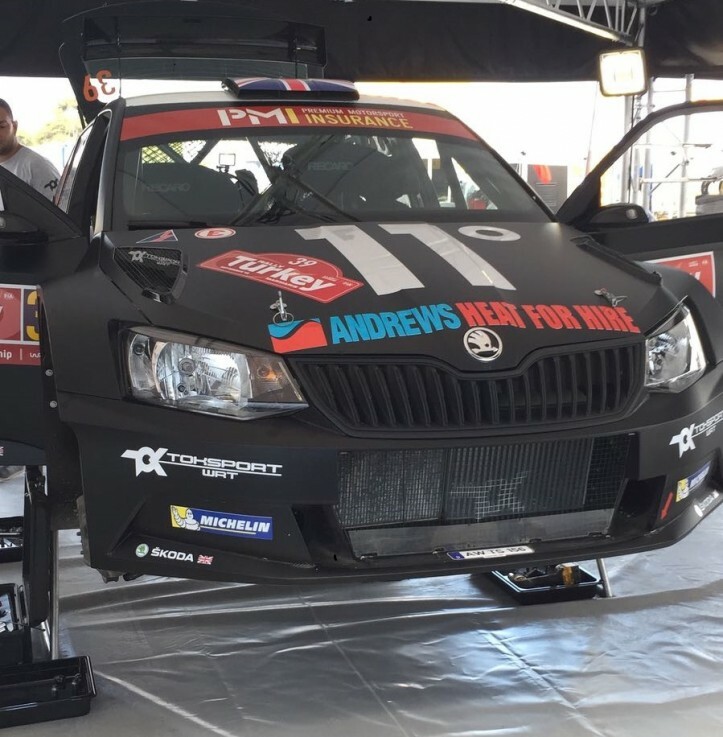 The Andrews Heat for Hire branding is now prominently emblazoned on both the front bonnet and back bumper of his Skoda R5, which should make it even more visible to the millions watching at home! Rally Turkey provides Chris with the optimum platform to demonstrate his incredible proficiency behind the wheel and compete with some of the best drivers on the planet. It’s an exciting challenge for everyone connected with Chris, and we’re really proud of our association with the country’s number one ranked rally driver. As always, we’d like to wish Chris the very best of luck ahead of this weekend and are delighted that we won’t have to wait too long to see him in action again with Rally Poland just around the corner! This article was posted in Andrews Sykes Group Plc, Brief, Heater Hire, News and tagged Andrews Heat for Hire, Andrews Sykes, Chris Ingram, ERC, FIAERC, FIAWRC, World Rally Championships. Both comments and trackbacks are closed.